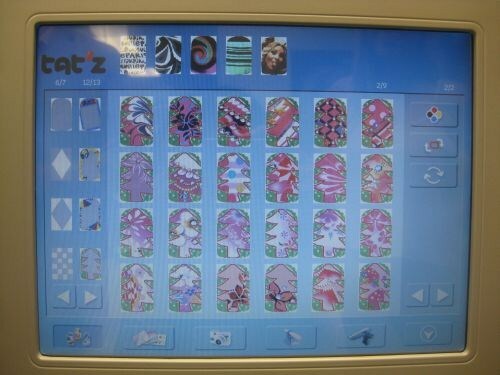 Is a machine the future of nail art? Last night, I attended a West Coast launch event for Tat’z Nail’z, a nail art printer that literally prints a completed design onto your nail (that’s my machine-printed design in the pic). The event was geared toward nail salon owners and managers, with the idea being that you could offer a quick nail art upsell to your clients — who could peruse through the design look book while getting their mani-pedi. 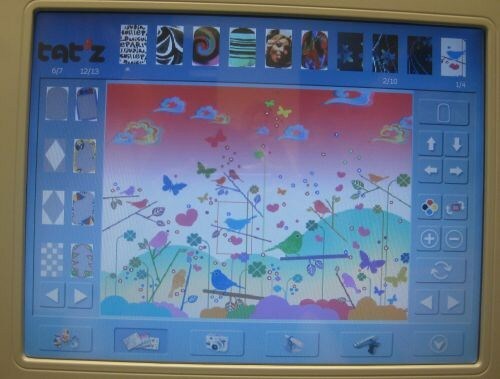 The machine is pre-loaded with 3,000 designs. I certainly don’t think it’ll replace handpainted nail art, but I do think it would be fun gimmick for a salon party. And I have to admit, the machine had some cool features. Because it has a camera on the front, you can snap a photo of anything and put it on your nails. One of the attendees snapped a photo of the striped pattern of her dress, then had it printed on her nail. Others were putting their smiling faces in front of the camera and donning them on their digits. In addition to the 3,000 images you can change the shape of each of the designs to create even more options. For instance, here’s a page of designs that I turned into the shape of a Christmas tree. You can see some of the other shape options on the left. If you want 10 nails that are complementary, but not identical, then use one of the pre-loaded big pictures (or upload your own with a USB drive) and simply select a part of the picture for each nail. Maybe you want a bird for one nail and a branch for another. Preprinted nail designs on tips are a retail option with Tat’z. The machine is available for either purchase or lease. Watch the promotional video here. I’m curious to see if and how it will take off in salons.